Take knob off bottom pots lid. Pound bottom of pie pan until it fits the lid of the pot being used for the boiler bottom pot. Mark center of pie pan and drill a small hole, then larger and larger until it is 7/8. If .75 is as close as you can drill then use a file or rotary rasp to make it bigger until the copper pipe just fits. See use of step drill bit in in photo at right. Do the same for the pot lid. 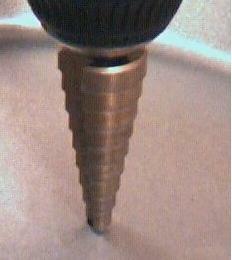 The step drill bit can be purchased from Harbor Freight tools. Drill a side hole near the bottom of the pie plate for the 5/16 copper pipe. Sand off nonstick layer on the outside. Cut about 4.5 to 4.75 length of 5/16 copper pipe and flare a bit of one end. Ream the inner ridge on the other end. Run the pipe through the hole and solder the pipe on the outside to the Pie pan. Cut off a 3/8 inch length of .75 diameter copper pipe. Solder the pipe to the pie pan or the top of the bottom pots lid. Bend up holding tabs on the pie pan or solder .25 tubing circle to pie pan to hold top pot. Mate the pie pan with the lid and drill holes for 8-32 SS bolts. Cut a peace of fiber glass material to fit the size of the pie plate. Put a bit of silicon sealer between the pie plate and the lid where the .75 pipe goes through, then assemble and tighten bolts. Cut a 3.25 by 3.25 sheet metal peace can use an old caned food can lid. Drill a hole and put 2 or 3 washers under it and a nut on top. Bend a paper clip and mount the meat thermometer on the side of the top pot.